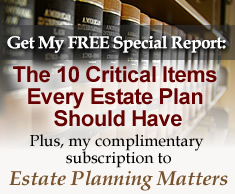 National Estate Planning Awareness Week | The Levin Law Firm - Philip Levin, Esq. In 2008, Congress designated the third week of October as “National Estate Planning Awareness Week.” The reason for this designation is that most Americans do not have an adequate plan in place to handle disability or death. Revocable Living Trust. Upon either disability or death, a Revocable Living Trust allows persons you designate (“successor trustees”) to easily take control of your assets and to follow your instructions about what should be done. During disability, your successor trustees will be able to pay your bills and make sure that your investment and financial needs are handled properly. Upon death, your successor trustees will be able to settle your estate, without court involvement, and distribute your assets to your beneficiaries on confidential terms and conditions that you establish. Funding Documents. In order for a Revocable Living Trust to be effective, your assets (other than retirement plans, life insurance, and annuities) should be titled to your trust. Check your bank statements, financial statements, stocks, bonds, and deeds to real property to make sure that your trust –and not you as an individual –is the registered owner. Beneficiary Designations. Retirement plans, life insurance, and annuities are typically not titled to your trust while you are living. As such, you should make sure that the “designated beneficiaries” for these assets are up-to-date and coordinated with your overall estate plan. If you do not have a copies of your Beneficiary Designations, ask your financial institutions for copies and keep them with your estate planning documents. Pour Over Will. Even if you have a Revocable Living Trust, you should also have a Pour Over Will. The Will names your trust as the beneficiary for any assets that are not titled to the trust or do not have designated beneficiaries. A Pour Over Will can also handle assets that you neglected or forgot to title to your trust. Durable General Power of Attorney. A Durable General Power of Attorney designates someone to handle matters for you during a period of disability (an “agent”). Your agent will be able to handle any assets during disability that are not titled to your trust. In addition, your agent will be able to sign tax returns on your behalf, have access to your mail, and deal with Medicare, Social Security, and other government agencies. Advance Health Care Directive. Your Advance Health Care Directive performs two key functions. First, it gives authority to someone you choose to make health care decisions for you during a period of disability. Second, it allows you to express your wishes as far as how that person should make such decisions. HIPAA Waiver. HIPAA is a law that, among other things, protects your medical privacy. It prevents health care providers from disclosing your health information to third parties. This can become a problem when your successor trustees, your power of attorney agents, or your health care agents need to know your condition in order to carry out your plan. A HIPAA Waiver authorizes health care providers to disclose your health information to certain individuals you designate. For “National Estate Planning Awareness Week,” take the time to consider these documents listed above. If you do not have any of the documents, think about whether you might need them. If you already have these documents in place, take the time to review them to make sure they are up to date. A qualified trust and estate planning attorney can help navigate you through the process. Please feel free to share this edition of Estate Planning Matters with your clients who need to establish or update their estate plans.